Back in 1990 I decided to check out the claims of not only Ron Wyatt but also of others who said that they had made Biblical discoveries. I planned to make a trip to the Middle East to see for myself, as scripture says, whether those things were so. I also wanted to come to some conclusion about the things that I had been hearing. One night while watching a Bible based television news show I heard Ron Wyatt telling of his discovery of Noah's Ark, not up in the ice and snow where it would be almost impossible to get to, but in an area where you could actually go and check it out. The person interviewing Ron mentioned the fact that Ron had written a book. So, the next day I went to a large Christian book store expecting to find a shelf full of expensive, professionally marketed and cleverly written books telling all about Ron Wyatt and his discoveries. Boy was I surprised! When the owner of the book store finally got the book for me, I found that it was an inexpensive, simply stated, documentation of the claims both pro and con as to the discovery of Noah’s Ark. From the book I was able to find out Ron's address and from that his telephone number. After several tries, I was finally able to reach him and during our conversation I asked him if I could come and talk with him about his discoveries. He said: "come on over"; and when he found out that I would be flying in he insisted on picking me up at the airport. When I arrived at the Nashville Airport he was right there to meet me. I was taken to his home where I spent the day and half the night looking at video, artifacts and other very convincing documentation as to the discovery of Noah’s Ark as well as many other things. I told Ron that I planned to make a trip to the Middle East, and before I left that night, he asked: "When are you going over?" I told him when I was going, and to my surprise, he said "Well, If you will help me work on Noah's Ark, I'll just go with you." I couldn't believe it. There I was trying to figure out how to get to all these places and now the man that made the discoveries was going to personally take me there. I don't think that he really expected much help with Noah's Ark. That was just a nice way for Ron to say that he would like to help me, without saying so. In other words, He was going to help me but he had turned it around like he needed me to help him. That is the way Ron was if he thought that you were honestly searching for the truth. He would do anything to help. He was a little different if he thought otherwise. Well, maybe a lot different! We made our trip to the Middle East and I tried my best to be of as much service as possible. I must have been of some assistance, because he has allowed me to help ever since. I have even had the honor to be on hand as new discoveries were made. Please allow me to share with you what I have learned, not only about the discoveries of Ron Wyatt, but about Ron Wyatt the man. To begin with, the discoveries of Ron Wyatt "just don't fit in" with "traditional thinking" and when you go against "tradition" you are asking for it. Ron knew that; and was willing to take the criticism. Over the years he got it! I am not saying that all traditions are no good; but I have found that when you hear the word "tradition" or "traditional" you need to check it out "real good." As the Bible states "Prove all things; hold fast that which is good"
The site Ron proclaimed to be the remains of Noah's Ark is not on Mount Ararat. It is on the mountain next to Ararat. Now, traditional teaching says that Noah's Ark landed on Mt. Ararat; but when I began to check things out, I found that the Bible does not say that at all. It says that Noah's Ark landed upon the mountains of Ararat; mountains plural. In the Hebrew text, it literally says the mountains of Urartu: that whole mountainous region of Eastern Turkey. When I began to check things out, I found out that Mt. Ararat is a 17,000 foot volcano which has erupted less than 200 years ago. I also found out that where most people have been looking for Noah's Ark, on Mt. Ararat, is in the Ohura Gorge, a vast area that "blew out" during the eruption. I found out that Mt. Ararat has a glacier on top of it that replaces itself (flows down the mountain) every 500 years or less. Even so, people look for Noah's Ark in the ice. What is left of Noah's Ark is not what Hollywood would like to portray. I had seen television shows depicting people climbing ladders to the top of the Ark which looked like, as one might say, "it just came off the showroom floor." We have been programmed to believe that, if it is on TV, it must be true. The television show, that I had seen, had people climbing around on Noah's Ark in the ice and snow on Mt. Ararat. They also said that they had found petrified wood there. It was very convincing; but I later found out that the person claiming to have been there had never even been to Turkey. He was a paid actor who had taken wood, soaked it in juice, and baked it in an oven to make it look old. By the way, I no longer watch TV. On the other hand, Ron took me to Turkey and showed me something that you could look at, and touch. What I saw looked like the remains of a giant ship. What Ron was talking about was really there! He showed me a "boat shaped object" composed of material containing organic carbon, which is what is found in petrified wood. He pointed out metal fittings, which contain modern day alloys. He showed me what appear to be vertical and horizontal deck support timbers, rib timbers and other features that are evenly spaced. The Bible tells us that Noah's Ark was 300 cubits in length. I measured it myself. What Ron said was Noah’s Ark was 300 cubits long. Now, there are people who say that there is absolutely no evidence that would support the claim by Ron Wyatt that this could possibly be the remains of Noah's Ark. I believe that after you study the pages of this web site you will have a different opinion. Many damaging things have been said about Ron, which, through first hand knowledge, I know to be totally false. Authors have spent pages trying to disprove his findings and speakers without any evidence of their own go to great lengths to discredit him. Most of these people have never taken the time to check out the things they are talking about! Ron's response "Well bless their heart. If I hadn't seen these things for myself I would be a skeptic too." Ron Wyatt said that "boat shaped object" was Noah's Ark. The Turkish Government and their scientists agree. They have declared the site to be the remains of Noah's Ark. They have declared it a National Park and a National Treasure. The site is now on the Turkish map as Nuhun Gemesi, Noah's big Boat. A visitors center has been built at the site and full time security is maintained there. Can anyone honestly believe that there is absolutely no evidence? You be the judge. 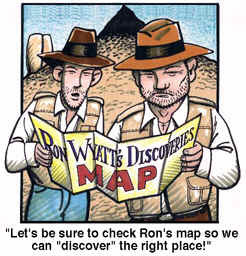 I could go on and on about the discoveries of Ron Wyatt but that is what this web site is all about. What I would like to do now, is to tell you what I have discovered. I discovered a man that was truly concerned about the salvation of others - about the needs of others - a generous man that had love, joy, peace, longsuffering, gentleness, goodness, faith, Meekness, and temperance: the fruit of the Spirit. That doesn't mean that Ron was a weak man. With those trying to interfere, with the work that Ron felt that he had been called to do, he could be as stubborn, ornery and disagreeable as a person could be. Because of his discoveries, he was contacted by all types; many with what have seemed to be good ideas. Ron was always willing to give a person an opportunity to prove themselves. It is sad to report that most were found to be opportunist. I did not agree with Ron on everything. He accepted that, as he did disagreement from others whom he believed honestly loved the truth. On the other hand, you did not disagree with Ron just to be disagreeable. There is one thing for sure: He would not allow the negative comments nor the destructive actions of others to interfere with the work at hand. I did not always agree with the way Ron did things. Sometimes, I would wonder "why in the world he was doing something the way he did it." I soon learned to be patient; for I knew that his intentions were good and that he would get the job done, one way or another. Even so, he did not always demand to have his way. If I was in charge of a project, he would do it my way. I am sure that he sometimes wondered "why in the world is he doing it like that?" I think that he knew that I would get the job done too. Ron was always trying to help others; not expecting anything in return. I have seen him stop everything and spare no expense to help someone in need. Books could be written about Ron's efforts to help others. He truly practiced going out into the "highways and byways." Ron claimed that he had talked with angels and when we would work he was always picking up strangers, both to help the stranger and also because he thought he might be entertaining "angels unawares." Let me tell you, some of them were no angels. Even so, Ron loved to help them anyway. In working with Ron I have seen things and experienced events that can be described in no other way than "supernatural." I could tell you many stories; but just let me say, I know who Ron was working for. Ron’s main goal in life was to "help somebody get to heaven." When considering an archaeological project, Ron’s main consideration was "Will it help somebody get to heaven?" He would always say: "If it won’t help somebody get to heaven I don’t want to do it." Ron spent his life doing the work he was given to do. He made dozens of trips overseas, spending everything that he could earn between, to work on the projects at hand. He always said "The LORD is coming and it won’t do any good to have a bank full of money." Ron Wyatt was a "Man of God." Even so, he was just a man, with attributes and faults just like you and I. He would be the first to tell you that there is "none that doeth good, no not one." People would always ask Ron why God had allowed him to find "all those things." Ron would always give a humble answer, not taking personal credit for his God given abilities. I believe that the reason God allowed him to find "all those things" is because he was willing to look for them. Most people do not realize how much hard work it takes to do what Ron did. He was willing to give his life in the service of his Creator. God has always used men like that. Ron understood these things and spent his "time" about his "Father's business." To sum it all up, I guess you could say that Ron Wyatt was about the nicest, kindest, most stubborn and ornery person that you could ever want to meet. What better friend could anybody ever want. I loved him; and I miss him. judgement on Gomorrah still there.